Hindu Wonders in a Muslim Country! Many of us know that Indonesia is the largest Muslim country in the world, but many of us do not know the fourth largest Hindu population is in Indonesia! This is the country which has highest number of Hindus outside Indian subcontinent (next to Nepal and Bangladesh). It is a country with 17,000 islands and 300 volcanoes. Bali Island has the biggest Hindu population in Indonesia. There are over 4,600 Hindu temples. But the Balinese follow some strange and ancient customs not known in India! Saraswathy Puja/ Vijaya Dasami is a national holiday here. Temples with 11 tier towers are of Shiva, 9 tiers –Brahma and 7 tiers- Vishnu. 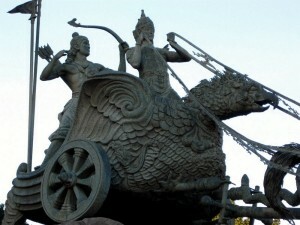 Badara Guru, a form of Shiva, was typical Indonesian Hindu God. Brahmi script is the basis for all the S E Asian languages. Sanskrit words are found everywhere. Sumeru, Brahmo, Kaliya mardhan, Tharmasagara etc. The language of Indonesia is Bahasa=Bhasha=language in Sanskrit. Thousands of Tamil and Sanskrit names are found in Indonesia, many of them in their corrupted forms because of distance in time and space. Kawi is the language of poetry in Indonesia. Kavi means poet in Sanskrit. Agastya whose name we find in Rig Veda, is associated with Tamil language from the very beginning. He was the one who established land route to South India by crossing the Vindhyas and he was the first one to travel across the ocean for migration. (Please read my article “Is Bramastra a Nuclear Weapon?” for more details about Agastya drinking the ocean). So Agastya statues are dug out in several places in South East Asia. Some are in Indonesian museums. A two meter tall Agastya idol was also discovered. 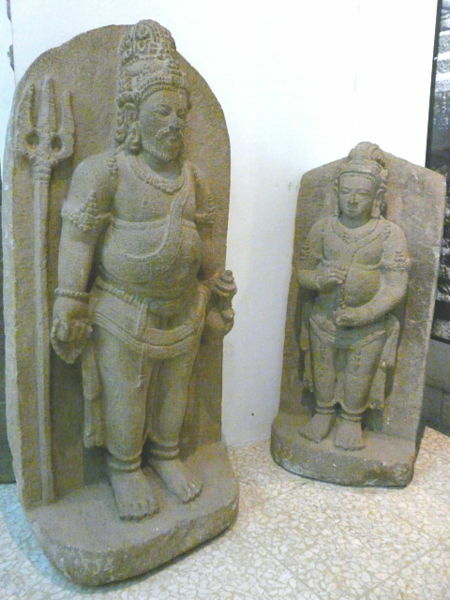 Singasari and Yeh-Pulu were two places which gave us lot of Hindu statues and Idols. 26. Bali Yatra: People from East Coast of India went to Java and Sumatra islands for business two thousand years ago. Even today Bali Yatra is done symbolically from Paradeep port of Odisha to Bali islands in Indonesia. Paradeep may be Para Dweepa=port for Islands beyond and Bali= named after the king Bali who was sent to Patala =islands below India , by Vishnu in his Vamana Avatar. If it is true this must have happened before 1500 BC. Vaman avatar is mentioned even in Rig Veda. Pallava Dynasty’s trade with the Indonesian islands is referred to in a Malay language History book. 28. Music and Musical instruments: Indonesian musical instruments and the tunes/ ragas are very close to Indian classical music. A lot of scope for research awaits music scholars. 29. Balaputra Deva of Indonesia erected a monastery in Nalanda. It shows that the Mahayana Buddhists travelled to Nalanda University in Bihar 1600 years ago. 30.Recorded history takes us to 73 AD, when a Prince of Gujarat landed on Java Island. Tara daughter of Dharmapala, a king of Bengal introduced Mahayana Buddhism into the island around fifth century according to Dr Stutterheim, the Dutch archaeologist. 31. The great Indian astronomer Aryabhatta (476 AD) calculated noon at Yavakoti (in Java) when it was midnight at the land of Romans. So these islands were known to all Indians by fifth century AD. 32. A legendary Indian called Aji Saka taught the Javanese their system of writing and chronology, and gave them their first social and political organisation. Indonesia is greek, indo means India, and nesos means islands.